In October 2011 a specialist early music chorus from Seattle made its first Boston appearance on a Sunday afternoon filled with musical events in Boston, only to find that their appearance was all-but unnoticed. 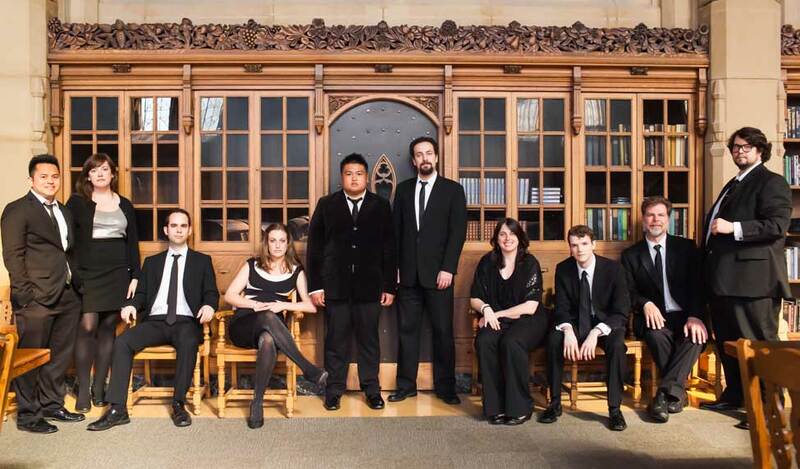 I reviewed the Byrd Ensemble very enthusiastically, and I write about them now to draw attention to their forthcoming program in the Fringe Series of the Boston Early Music Festival (Sunday June 9 at 7:30 pm, First Church, Boston). The Byrd Ensemble was assembled by a Seattle singer Markdavin Obenza, has been singing since boyhood, first in the Seattle Northwest Boychoir and had small parts in Seattle opera productions, such as the shepherd boy whose offstage voice opens the last act of Tosca. Like many of the singers in the group, he had years of experience in Episcopal cathedral choirs (just as so many of the top British early music singers have done). And he took a master’s degree in music theory at the University of Washington. He organized a group of like-minded singers in 2003 as the Renaissance Singers, but they decided to adopt a less generic name when they put out their first major recording in 2011. Since their repertory centered strongly on English music of the Tudor period, they took the name of the greatest composer of that milieu, William Byrd. This was a natural choice for a group many of whose members had studied with Peter Philips, director of the Tallis Scholars (Philips was guest conductor for their previous Boston appearance). Under the new Byrd Ensemble name, they have issued a CD of music from the Peterhouse Partbooks (featured in 2011) and a newly issued recording entitled “In the Company of William Byrd,” the music on which will form the program on June 9. It is an unusual concept for a program of Tudor-period music, emphasizing the familiarity of Byrd with other musicians of his day, both those active in England and also—somewhat more surprisingly—Continental composers whom the homebody Byrd surely did not know in person, but with whose music he was familiar. The program was shaped with the assistance of Byrd scholar Kerry McCarthy, who has just this year published a full-length biography of the composer (Oxford University Press). Byrd remained openly Catholic even during Queen Elizabeth’s reign; his evident genius protected him from attack or imprisonment. But he could not publicly write music for the Roman Catholic church. Still, his output—and Sunday’s program—includes a large body of Latin motets, which circulated on the Continent for performance in Catholic circles, while in England they became a kind of vocal chamber music for private performances in homes were the most highly-developed musical skills were cultivated. Each of Byrd’s Latin motets in Sunday’s program is paired with a work by another composer that shows stylistic or structural relationship. One of these is a French chanson (O doux regard) by Philip van Wilder, a Flemish lutenist who was brought to England by Henry VIII; Byrd borrowed from it for a motet. The remaining paired works are all Latin motets by musicians active in England—Byrd’s student Thomas Morley and the immigrant Italian Alfonso Ferrabosco—and two of the most significant of foreign composers who apparentlynever visited England—Clemens non Papa and Philippe de Monte. In reviewing the 2011 performance, I felt that the Byrd Ensemble was a first-rate chorus for this challenging repertory, in sound, technique, and expression. These motets are shaped into a complex polyphonic web that can seem entirely opaque to the ear if not sung with accuracy and clarity. The Byrd Ensemble singers perform with two voices on a part, producing a sound that is strong enough to fill a substantial space, but with a very careful attention to blending the twin voices on each line to provide that essential clarity. Their return to Boston, in conjunction with their 10th anniversary season, is most welcome, and I hope it will encourage many lovers of the rich Tudor repertory to make the personal acquaintance of the group in performance. (I might add that, despite their name, they will soon be recording two discs of contemporary scores, by Arvo Pärt and Peter Hallock.) In a week of extraordinary events, this should nonetheless be one of the highlights.